I spent 4 days searching for the main ingredient in these krispie treats. Jello Pumpkin Spice Pudding mix. I have a simple love of putting pudding mix into my Rice Krispie treats. Gives them a whole new flavor, and keeps them moist! It’s a secret to how to make rice krispie treats that are perfect every time. I found the pudding mix at Walmart. And I stocked up! I have more ideas on how to use it, besides making pudding of course! So if and when you find it, buy extra boxes. Just in case! These little treats went fast around here. I topped them with some melted white chocolate and sprinkles. Super quick to make, and easy too! Banana Rice Krispie Treats– flavor your treats using Banana pudding mix. Then eat them for breakfast. 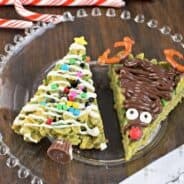 Pistachio Rice Krispie Treats– using Pistachio pudding mix, drizzle these with dark chocolate for an over the top dessert! Cherry Rice Krispie Treats– use Cherry gelatin mix to flavor these krispie treats. Cover the tops in dark chocolate. YUM. Want more Rice Krispie Treat Recipes? Come visit my Rice Krispie Treat Addiction Pinterest Board. Line a 9-inch square baking pan with foil. Grease the foil with butter (I use the butter wrapper to grease the foil dish). Set aside. In large pot, melt butter over medium heat. Add in marshmallows and stir constantly until melted (lower heat to low-medium). Remove from heat and quickly stir in pudding mix. Fold in cereal. Pour mixture into buttered foil pan. Press treats into pan (but not too hard, that will dry them out). Spread melted white chocolate over top of treats and sprinkle immediately with sprinkles. Allow to set about 1 hour. Cut and serve. ENJOY. Thank you for this delicious recipe! I’m heading to Walmart in the next day or two, to see if they carry that pudding flavor here in Canada. If they do, this will make an easy, delicious treat for our community connect time during churchy this Sunday! Payments in sugar. I love it!!! But I’m no help…I’m a lost cause. Food styling is the worst part of blogging to me…but thanks for the kind words! I need to get my hands on that pudding! I had no idea to ever put pudding mix into krispy squares, but if they’ll make them taste and look like these, I’m now a firm believer in it! Oh these sound so good! I love RKTreats in any way shape or form and with pumpkin pudding and the white choc frosting, even better! my sister just made these but a little simpler. She used the pumkin marshmallows(just as hard to find) instead of regular and made the treats like normal. No pudding. It was hard to stop eating them!! Aimee, I just made pumpkin rice krispie treats last night! no pudding mix, but pumpkin puree instead! We are both in the pumpkin state of mind! I love RKTs – to easy and versatile! I love your frosted and sprinkle topping 🙂 Great addition! Thanks Sally! I thought about using the pumpkin puree…but I’ve had such luck using pudding mix that I went that route! Can’t wait to see your version! love paper and twine wrapped around the goods. Yay for yummy pumpkin flavored rice krispies! I almost made mine with pudding the other day, but opted for the marshmallows instead. You are going to crack up when I post mine because they look so similar. Well, except for the fact that yours are wrapped up way cuter:-) Love the paper and twine!!! YUM!!!!!! As always, awesome idea, thanks for sharing! 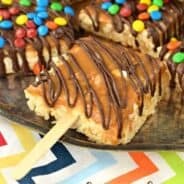 Ive never made Rice Krispie Treats using pudding mix, sounds so good! What a great idea to add pudding mix to Krispie Treats. These treats look and sound do good. I remember seeing the pumpkin pudding mix last year at Walmart and bought some…now it’s time to stock up again. 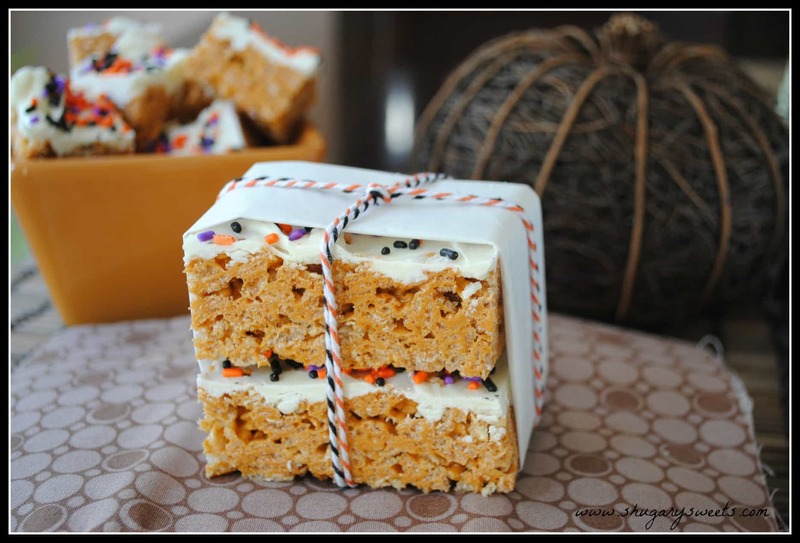 What a great idea to put pumpkin spice pudding mix into your krispies. Thx for the tip! love this idea, thanks for the recipe! Wow- I am so glad I found your blog and this recipe. I never would have thought to use a pudding mix. Fantastic! I wanted to invite you to Wonderful Food Wednesday at At Home Take 2… love it if you could link up 2-3 recipes. Hope to see you there. I have a box of this pudding mix and haven’t decided what to do with it yet–but these are calling out my name…especially since I have everything to make them in my panry right now. LOVE rice krispie treats!! Yum. Great picture of a really delicious treat. rice krispie treats are one of my faves! these look so good! yum! pumpkin pudding mix is going on the shopping list right now. I MUST make these!! These are just beautiful. A new pumpkin treat I have yet to make, thank you! Visiting from Hubby Made Me! Those look so yummy! I love the pumkin spice pudding. What a great idea to use it in Rice Krispie treats. Heading to your Pinterest board! super yum and the packaging is wonderful!!! so cute and delicious sounding I’ll definitely have to give this a try! 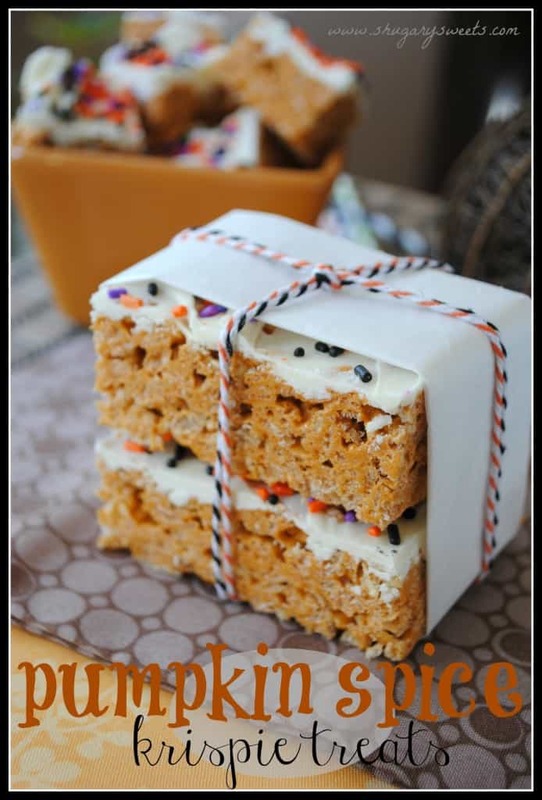 I love pumpkin treats and have been thinking of making some pumpkin rice krispie treats. Yours blow me away Aimee. Wonderful! Will have to get some instant pudding next time I go grocery shopping. Yummy! 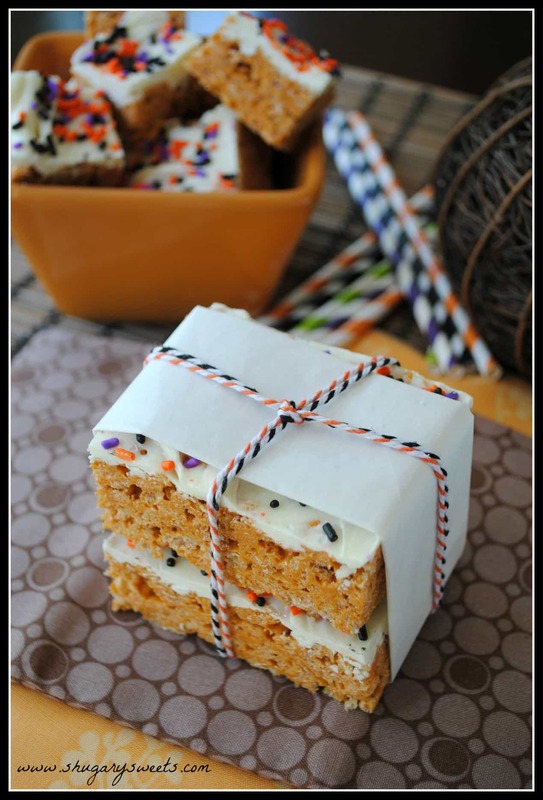 These pumpkin spice rice krispie treats look amazing! 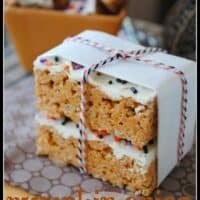 I love rice krispie treats and pumpkin flavor, so this is definitely on my list of treats to make. Thank you for sharing it on I Heart Nap Time! Yummy! And now I know what to do with all of the pistachio pudding I stocked up!! lol Thank you for the recipes! You’re welcome. The pistachio version is so yummy! These look delicious! Found you on Skip to my Lou’s link up. I hope you find the pudding mix! I need to make these! I just pinned them, thanks for sharing! Pudding makes everything better! 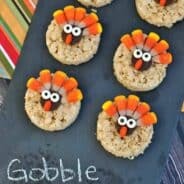 What an adorable presentation, I love a rice krispie treat, I’m sure I’d love it with pumpkin spice pudding mix in it! I love your presentation. I need to duplicate it to take for my coworkers. I think they would love these. I had the problem of not buying enough of the pumpkin spice pudding last year. Learned my lesson & stocked up this year. Now I’m on a qhest to find the gingerbread pudding. Sounds awesome. Thanks for sharing with us. Pumpkin spice anything is a favorite. Halloween is the best time of the year in my opinion. Pinning to make in a few months! Love this idea! I make pumpkin spice cocoa mix with my pumpkin spice cocoa, never thought of this! It’s going on my to-do list! Thanks for posting!! mine came out so soggy. What did I do wrong??@@? The original RKT recipe calls for 6 cups of cereal. I wonder if adding that extra cup will make the difference. Yum! I’m going to try these with a drizzle of cream cheese frosting instead of the white chocolate! There was no pumpkin spice pudding at the store But I found an alternative. They have pumpkin spice marshmallows! I got those, added a bit of pumpkin pie spice the same time I added vanilla pudding. Turned out So yummy, they only lasted a short time in the house. Just ran across this recipe. looks yummy. I was wondering if you could use vanilla pudding with the spices for pumpkin pie?